VietNamNet Bridge – The most famous temple in Vietnam’s Mekong Delta is Doi (Bat) pagoda. This pagoda’s name is actually Mahatup or Ma Toc. 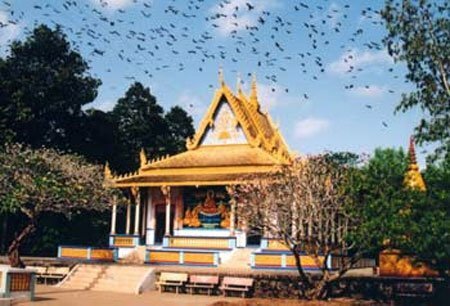 But it is widely known as Doi pagoda, because the pagoda’s garden is the home to giant bats. 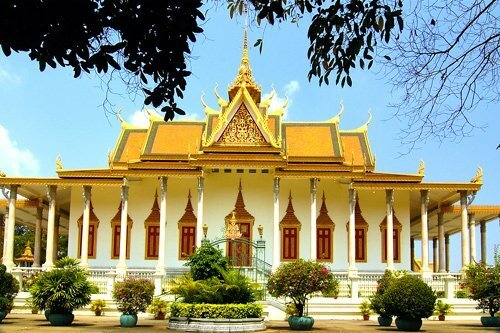 Located on Le Hong Phong St., 2km from Soc Trang downtown, Doi pagoda is the most famous pagoda in Soc Trang province. It was built in the 16th century and is one of the oldest pagodas in the province. The pagoda is famous for its beautiful architecture, especially its very large roof that houses tens of thousands of bats. 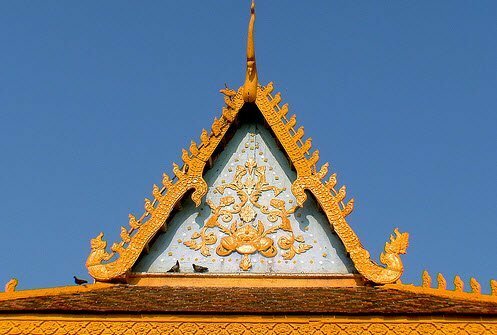 It presents an opportunity to contemplate Khmer arts, with skillful, symbolic decorations on its pillars and roof and splendid relieves and statues. The pagoda has two gates, the main and the second gate. It is strange that the main door is decorated very simply while the auxiliary gate looks outstanding, in golden color, and it is decorated by a pair of giant snakes, with five heads each. The pagoda is decorated by many reliefs and statues. On its walls are large-sized paintings featuring the life of the Buddha. In the 7ha garden, there are many stupas containing remains of monks. Besides its beautiful architecture, the pagoda is also remarkable for the large number of bats roosting in the trees behind the pagoda. Watching the bats take to the skies, it will occur to you that the pagoda is a unique natural reserve. Visitors can see thousands of bats swinging in immeasurably-high branches, as if performing in a circus. 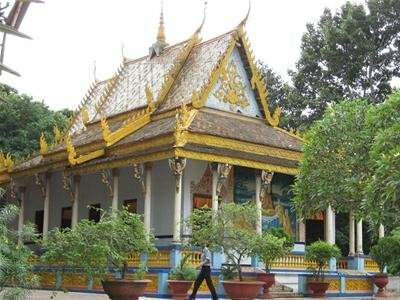 With a large space for trees, Doi Pagoda is a tranquil place to sit and becomes one of the best tourist attractions in Soc Trang. Monk Lam Tu Linh was busy with rebuilding the temple after the fire last August but he was enthusiastic to tell us about the history of this 400-year-old temple. According to the monk, Doi pagoda was built in 1569, on a sandy bank near the coast of Soc Trang. The first chief monk grew trees around the pagoda to prevent wind and sand from the sea. This garden drew a lot of birds, mostly storks, crows, bats, etc. He said that Soc Trang has a hundred of temples and many of them are very beautiful, peaceful and have vast gardens but only Doi pagoda attracts a lot of birds and especially bats. “I think that the proverb ‘birds perch in good land’ is true for this pagoda,” he said. To prove that the pagoda is a good place, the monk showed us many wells in the pagoda, saying that the pagoda’s underground water resource is very abundant. Water here is pure and can be used immediately. Meanwhile, local people cannot use underground water because the water is heavily infected with alum. They have to use pipes to take water from the pagoda to their houses. Nobody knows when bats came to the pagoda. An old woman said that she saw bats in the pagoda when she was a little girl. “Whenever they returned to the pagoda, they created a black cloud. The garden was vast but if they returned, I could not see the green of trees but only the black of bats,” she said. It is very strange that bats only perch on the pagoda’s trees. They even do not perch on branches of trees of families around the temple that extend into the pagoda’s campus. During hot afternoons, they flap their wings, making noise in the pagoda. It is also odd that these bats never evacuate their bowels in the pagoda, but in a garden that is far from the temple. However, the number of bats has been reducing, to several thousand at present, due to the appearance of bat restaurants in Soc Trang and neighboring provinces. Though Soc Trang authorities banned restaurants from selling cuisines processed from bats, but they could not totally control. Standing under the foot of an ancient tree, looking up to bats that were hanging on branches, monk Tu Linh sighed. He went to the garden to see the bats every day and gave a sigh because he clearly felt a reduction of bats. The monk said that scientists did not make thorough research of the bats at his temple. 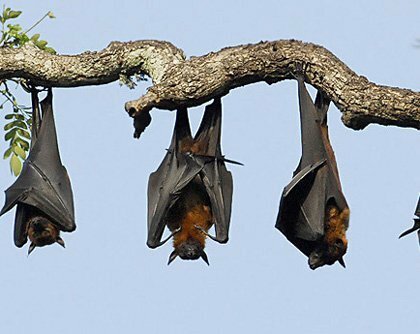 Several years ago, a scientist visited the temple and left only one bit of information: these bats are flying fox species, which is very rare. Monks already knew about it but it is the most important thing to how to protect these special bats. Perhaps bats at the Doi Pagoda are the largest species in Vietnam. A newborn bat has wingspan of up to 50cm. Adult bats are up to 1kg in weight and 1.5m of wingspan. Some bats are up to 1.5kg in weight and 2m in wingspan. These bats only give birth once a year and only one baby bat, in June. 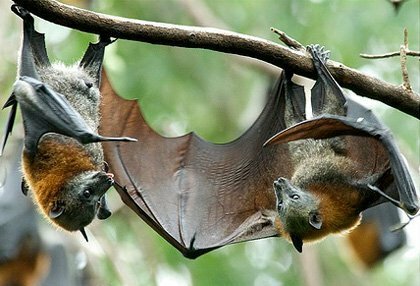 They do not build nets so after giving birth, they hold their babies through the night, for 3-4 months, until baby bats can fly and seek food themselves. 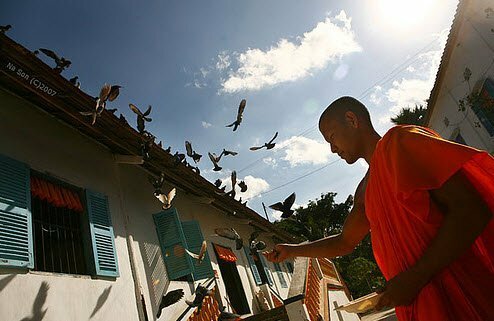 Monks have to carefully take care of mother and baby bats during their breeding season. Whenever a baby bat falls down to the ground, monks have to pick them up and put them on branches for mother bats to take them back. It is special that mother bats never mistake their babies. During storms, hundreds of baby bats fall down to the ground. Monks picked them up and brought them into the pagoda. When storms passed, they placed them on tree branches. Mother bats flew down to find their babies. For baby bats whose mothers were caught by hunters, monks bred them by milk and fruit and taught them to fly. It is very special that bats only accept the care only of monks. They can perch on monks’ shoulders and rub their heads into monks’ cheeks, but they are very fierce against strangers. These bats only eat fruit and drink coconut juice. Their teeth are very sharp and they can make holes in coconuts very easily. Though the pagoda’s garden has dozens of varieties of fruit trees, bats never eat fruits in the garden. Every day they fly away to seek food at 6.30pm and return to the pagoda at 4am. Any bat that does not return means that the bat is netted. These bats are very intelligent but they are usually netted by saving their friends. 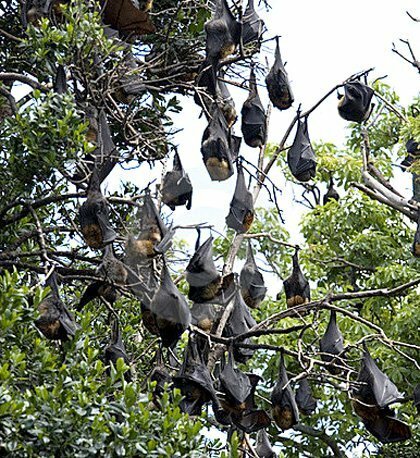 Hunters often tie several bats on trees as baits. Seeing their friends calling for help on trees, other bats swoop down to rescue them and they are also netted. How has climate change affected Vietnam?